Since Pullman & Comley’s founding in 1919, we have played a vital role in shaping our local communities and contributing to the legal profession. Our attorneys and staff are active and involved participants in charitable, civic, public service and professional organizations. We take pride in our “Dress Down Fridays,” which raise thousands of dollars for local charities nominated by employees, and in organizing the firm’s participation in events including the annual March of Dimes Walk for Babies, the Center for Family Justice's "Walk a Mile in Her Shoes," and the Hartford Arts Council’s United Arts Campaign. In 2016, as in years past, the firm’s attorneys and staff dedicated hours of their time to helping others in the community. In December 2016, the Regional Youth Adult Social Action Partnership (RYASAP) honored the firm with its Goodspeed-Pfriem Volunteer Award, for demonstrating outstanding volunteer efforts in the communities we serve. 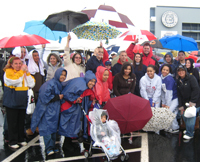 RYASAP works to ensure the safe and healthy development of young adults and families by actively engaging organizations, public officials and community leaders around important issues that matter most to the Greater Bridgeport region. Members of our Real Estate practice represented Connecticut Counseling Centers, Inc. (CCC) in its acquisition of a commercial building in Waterbury for a new clinic that provides substance abuse and related treatment services. The new clinic in Waterbury was essential to meet the growing demands of the community facing the opioid abuse epidemic sweeping the nation. Our attorneys represented CCC in acquiring the property, coordinating the efforts to obtain the necessary permits and approvals, and in closing loans with its lender to cover a portion of the new clinic’s costs. Several of our attorneys are members of the Connecticut Veterans Legal Center and assist veterans with a variety of legal issues. In one matter, two of the firm’s attorneys have been assisting a Vietnam veteran who was recently denied benefits for symptoms related to PTSD. In another instance, our attorneys are assisting a veteran in a complicated appeal, dating back more than 50 years, to establish that certain mental health conditions under treatment were service-connected. In the fall of 2016, Pullman & Comley joined the Pro Bono Institute, an organization comprised of many of the country’s largest and most successful firms that are dedicated to the mission of encouraging pro bono services. As part of our pledge, the firm has made a commitment of spending at least 3 percent of its annual billable hours on pro bono work. Pullman & Comley’s commitment to pro bono work reflects the firm’s long tradition of legal excellence and public service. We encourage our attorneys to take on pro bono work that serves individuals and nonprofit organizations that would otherwise not be able to afford legal representation. Public service matters generally are undertaken as a result of a referral from a legal aid organization such as Connecticut Legal Services, Inc.; Greater Hartford Legal Aid, Inc.; Greater Hartford Legal Assistance Foundation, Inc.; New Haven Legal Assistance Association, Inc.; Pro Bono Partnership; Statewide Legal Services of Connecticut, Inc. and Volunteer Lawyers for the Arts. Members of our firm also serve as court-appointed counsel for indigent clients on a wide variety of litigation matters. Pullman & Comley’s pro bono activities are coordinated by Adam J. Cohen, who also serves as a member and legislative liaison for the Connecticut Bar Association’s Pro Bono Committee. As coordinator for pro bono matters, Adam helps create opportunities for attorneys, summer associates and paralegals to volunteer for public service matters. In 2013, the Connecticut Bar Association Young Lawyers Section (YLS) honored Pullman & Comley for its contribution to the $1 Million Pro Bono Service Campaign. The firm was welcomed as a member of the $150,000 Club, designated to firms that performed in excess of $150,000 worth of pro bono service, and honored for the Highest Percentage of Attorneys Participating in a Large Firm. In total, 707.5 hours of pro bono work was performed by nearly 70 percent of our attorneys during a three-month period during 2013. The work reflects our firm’s long tradition of serving nonprofit organizations and individuals who need pro bono legal counsel.